The September issue of Military History Monthly, the British military history magazine, is on sale today. With a focus on the Battle of Adrianople, the conflict that brought about the end of the ancient world, MHM dissects the collapse of the Western Roman Empire. Rafe McGregor uncovers the horrifying history of one the most notorious military units ever formed. Patrick Mercer on the BEF’s Wellingtonian masterpiece at the Battle of Le Cateau. Matt Leonard explores the background of Henri Barbusse’s novel Le Feu, first published in 1916. Also in this issue: Behind the Image, Thinkers at War, War Culture, Book of the Month, Museum Review, War on Film, Event Listings, Competition, and much more. 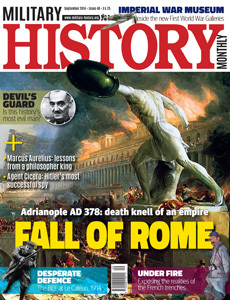 Our special feature this issue focuses on the Battle of Adrianople in AD 378. It has often been compared with Cannae: a battle of annihilation in which an entire Roman army was destroyed. In fact, Adrianople was more decisive. The Romans recovered from Cannae. They simply built a new army. Indeed, such were their manpower reserves in 216 BC that they could have survived several defeats on this scale. But in AD 378, the age of the mass citizen levy was long gone. The empire had become an edifice of state power resting on a foundation of exploited provincial labour. The soldiers were a small professional elite. The losses at Adrianople had to be made good, of course. But this was done by recruiting barbarian ‘federates’ – Germanic tribal contingents fighting under their own chieftains and hired en masse. Thus did Rome in decline create the agents of its own destruction. Adrianople was also a turning-point in the history of war: the moment when the heavy infantry of antiquity were finally displaced by the heavy horse of an embryonic medieval order. Patrick Mercer takes a hard look at another turning-point with his article on Le Cateau, the desperate defensive battle fought by the British Expeditionary Force on 26 August 1914. A battle in the style of Wellington, it was also the swansong of the old 19th-century Regular Army. Matt Leonard continues the First World War theme with a discussion of Henri Barbusse’s Le Feu, and Rafe McGregor investigates the infamous career of Oskar Dirlewanger and his SS Sonderkommando.